"I'm quite enjoying our discussion"
Keen to read Fenton's notebooks, Charles accompanies him to his halfway house — to spend the night before travelling on to Fenton's home. They arrive as the dusk is giving way to night. Description: Fenton and Charles approach the front of Fenton's 'halfway house'. 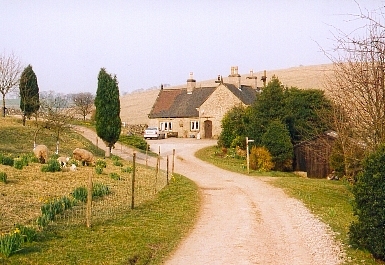 The house in question is Air Cottage — an isolated farm house (still a working farm, and now offering a bed and breakfast service) near the village of Ilam in Derbyshire. Where is it? : Air Cottage is located high above the Dovedale gorge, close to the village of Ilam. It is accessible via a number of public footpaths (marked on Ordnance Survey maps of the area) and from a track leading off the road between Ilam and Alstonfield. The entrance to the track (which begins with a cattlegrid) is located on the right hand side near the brow of the first hill after leaving Ilam. Where's the best vantage point? : The shot is taken from the pathway which leads past Ilam Tops Farm (Ellen and Ron's Farm) and towards Air Cottage. What about access? : The public footpath which leads past Ilam Tops Farm towards Air Cottage swings to the right of Air Cottage, before rejoining the main farm track on the far side of the farm. While it is possible to take many Ilam location shots from public pathways, it is important to avoid trespassing whilst visiting the area. This particular shot is taken from the public footpath. Anything else? : When Charles returns to the house later with Sanders and Jim, all three approach the house from the opposite direction. The development of Air Cottage since the days that Mad Dog was filmed is evident in the photo above — with an extensive garden and fenced-off farm areas now clearly visible. The waymark sign in the centre-right of the picture indicates the direction that the public footpath takes as it nears the house.